William S. Pizzuto Sr., 85, formerly of Morgan Street, Pittsfield, MA, passed away peacefully in his sleep, January 25, 2018 in San Antonio, Texas. Born October 1, 1932 to the late Domenico and Francesca Pitingola Pizzuto. He was a graduate of Pittsfield High School. William was married to the late Jean MacRoberts, who he was predeceased by in 2015. He was a machine adjuster for Shaefer-Eaton and was also a painter and a bartender. A communicant of the former Mt. Carmel Church, Mr. Pizzuto thoroughly enjoyed ice fishing, hunting and bowling. He was a member of the ITAM Lodge and was a founding member of the Turtle Club. Mr. Pizzuto leaves behind his sons, Dominick A. Pizzuto and wife Judy of San Antonio, Texas, William S. Pizzuto, Jr., of Pittsfield, MA, Daniel Pizzuto and wife Debra of San Antonio, Texas; a brother Thomas Pizzuto (Beverly) of Naples, FL, two sisters, Delores Albano of Naples, FL, and Emma Dobrowolski of Pittsfield; three grandchildren, Amanda, Frankie, and Daniel Joseph. He was preceded into death by his parents, wife and many brothers and sisters. 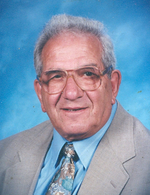 Funeral Notice: Funeral services for William S. Pizzuto, Sr., will be held Friday, February 2, 2018, at 11:00am at Dery Funeral Home, with burial to follow at St. Josephs Cemetery. Calling hours will be held at the funeral home on Thursday, February 1, 2018 from 4:00pm to 7:00pm. In lieu of flowers, donations may be made to the Berkshire Humane Society in care of the funeral home. To send flowers to the family of William S Pizzuto, please visit our Heartfelt Sympathies Store.